Plant kale in your garden to enhance the family diet with an easy to grow, nutritionally powerful green. Kale is an official superfood. Kale thrives in the cooler months of spring and fall but I have news! This Kale has been in the ground since last fall and it’s still tasty and tender! Our kale survived three severe winter cold snaps, being buried under a foot of snow and drowning rains. One section of this garden bed had really young kale in it when a severe NE wind storm came through and killed off all the top growth. We thought it was dead. But it all grew back when the weather warmed up. Amazing! In the heat of summer kale doesn’t do as well but will survive nicely into the 70F or low 80F degree range. possibly higher in favorable conditions. Even the slightly weather beaten kale you’re seeing in our garden is sweet and delicious. Kale is the easiest and hardiest crop we have ever grown! Soups and stews. Kale will hold up in them without becoming green slime. After this last winter of store bought organic produce, I’ll tell you, I’m very grateful for the store bought produce in winter. BUT! I absolutely can’t wait to grow our own fresh produce and eat it immediately after harvest throughout the cold storage months. It’s impossible to describe the difference in quality but, trust me, growing your own kale is a huge leap forward in nutrition and flavor. We can harvest kale most of the year even in our outdoor garden. Kale is very easy to grow, and tasty. Kale comes in several varieties. 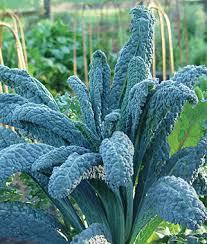 I encourage you to try them all and find out types of kale do best in your garden climate. just follow the directions on your seed packet. You can grow kale in any cool season and it will be fine. Kale detests REALLY hot weather, but it will tolerate a goodly amount of summer sun and heat. Discover which kale your family loves best! If you need more gardening information check out our garden section. kale is one of the best greens nutritionally! Look at the information I found at the whfood research site. Please follow the link to find really good information about the health benefits of kale. Lots of reasons to stake out a garden plot for this delicious, nutritious vegetable. Cancer-preventive nutrients called glucosinolates. Antioxidant and Anti-inflammatory NutrientsKale’s antioxidants are both traditional as well as recently discovered. kale also provides us with at least 45 different recently discovered flavonoids, including kaempferol and quercetin. Many of the flavonoids in kale are also now known to function not only as antioxidants, but also as anti-inflammatory compounds. Fiber and omega-3s are two macronutrients largely deficient in the U.S. diet and provided by kale in impressive amounts. It only takes 200 calories’ worth of kale to provide 14 grams of fiber — substantially more than the average U.S. adult gets in an entire day after a diet of 2,000 calories. kale provides us with a significant amount of alpha-linolenic acid (ALA), the basic building block for all omega-3 fats. From less than 100 calories’ worth of kale, we can get over 350 milligrams. Oasis Advanced Wellness on face book made this image.It lays out the health benefits of kale and has a nice kale chip recipe. We love our kale in juice and salads. I have never tried the kale chips but am increasingly curious. That recipe looks interesting. I enjoy trying out new varieties of this really interesting vegetable. We have grown the Russian red, Tuscan black, purple kale and the Scotch curled, more varieties to try though. Kale is really beautiful. It has several varieties that are show stoppers in the produce isle and really attractive on the table. Some kale is sold as an ornamental. This is actually edible as well, if organic! All your kale should be organic! This is a vegetable sprayed with a highly toxic pesticide when conventionally grown. The whfoods web page I linked you to has more on that. Kale has a longstanding history of helping humans survive winter with it’s incredible hardiness and nutrient profile, it’s beautiful and easily grown. Make it a diet staple! We absolutely LOVE kale in salads like this very popular Kale Apple salad with honey dressing. Our fall garden salad also uses kale as its base. We enjoy the extra texture kale gives to salads and sandwiches so much, we don’t even plant lettuce anymore. Plant kale for a beautiful, nutritious addition to your garden! Just pulled last years Kale out of our raised beds. Will be planting more for ’16… White Russian and Tuscan. The White Russian works well in salads. We haven’t tried that one! Thanks for the tip Richard! All the best to you and Catherine! I love kale! Here are many ways to serve kale. We get organic from our CSA farm in May-November, but the rest of the year it’s tempting to buy the supermarket stuff…. I try to hold out for organic from the food co-op. We have a very small, urban yard. I tried planting kale once, but it simply didn’t come up. Will try again this fall after the flowers die back. It would be nice to have something growing through the winter. Hi Becca, Thanks for stopping by Homemadefoodjunkie! I checked out your link and was surprised you haven’t tried salads with kale as a base. We LOVE kale salads here. Kale is amazing in green juices as well. I hope you do try to grow it again in cooler weather. Our climate here is perfect for kale and it grows all year, very prolifically. I’m glad you buy only organic kale. It’s one of the worst veggies to buy conventionally due to all the toxic sprays they use on it. Have a great day! Beautiful, I need to plant kale in my garden, thanks for sharing with Hearth and soul blog hop. pinning. Thank you for the visit Swathi. I hope you do give growing your own organic kale a try. We love growing and eating this healthy veg!